Daihatsu MOVE Conte Revealed..."Conte" Must Mean "Box"
When Daihatsu announced the latest iteration of their MOVE Kei car, we were pleased to see they chose a car that sounded like a part of the female anatomy, thus allowing us to expand our Ten Worst Car Names list. This particular four-door minicar gets either a normally aspirated three-cylinder mill good for 58 horsepower or a small turbocharged three-banger that puts out an earth-moving 63 horsepower. Available in either 2WD or AWD, the little one can achieve a maximum US cycle fuel economy rating of 54.1 mpg with the NA engine and 2WD. The longest press release for a non-Renault small car imaginable below the jump. Daihatsu Unveils New Mini Passenger Vehicle MOVE Conte DAIHATSU MOTOR CO., LTD. (Daihatsu) announced on August 25 the nationwide launch in Japan of a new mini passenger vehicle: the MOVE Conte. *1 The MOVE Conte was designed to have an interior that is both comfortable and relaxing and supports individuality in response to diversifying needs, such as the preference for space comfortability interiors and simplicity. The new vehicle maintains the basic performance of the MOVE, while adding to the refined square-shaped styling a number of functions and furnishings that enhance the level of comfort and relaxation. An additional element unique to the MOVE Conte is the highly attractive MOVE Conte CUSTOM model. The new MOVE Conte offers the following features: 1) Individualistic styling - An advanced, fun-filled square-shaped styling - An interior with a modern, low-key style 2) A Comfortable interior - Luxurious sofa-style seats create an interior that is comfortable and relaxing and the power-seat on the driver's side facilitates entry - Spacious interior creates additional comfort for front-seat passengers - Exceptionally quiet and smooth ride improves comfort 3) Same outstanding basic performance as the MOVE - Outstanding cruising, safety, and environmental performance through adoption of the latest platform and power train *1:Origin of the name Conte: 1) A Japanese-style abbreviation of the word "continuity," referring to the continuity of script in a storyboard. The name indicates that the vehicle is an expression of individualistic lifestyles. 2) Also an abbreviation of "comfortable interior," which indicates that the vehicle is designed to ensure passenger comfort. The monthly sales target is 4,000 units and the manufacturer's suggested retail prices range between 990,000 yen to 1.595 million yen (excluding consumption tax). Vehicle Outline 1) Individualistic Styling MOVE Conte Design Exterior Advanced, Fun-filled Square-shaped Styling - Taking "square plus" as its design concept, the MOVE Conte condenses the necessary functions to achieve simple but highly refined styling. - The bold surfaces with slightly sculpted contours eliminate unnecessary adornments to create a simple and modern square-shaped style, while the links between surfaces have been chamfered to provide stability and create a refreshing impression. - The individualistic styling is expressed in an unobtrusive way in one of nine different colors*2 (including a new color). *2: Including two manufacturer optional colors Interior A Modern Interior that Expresses a Low-key Stylishness - The interior maintains the bold surface structure of the exterior with a streamlined horizontal tone and red accent lines that link the instrument panel with the door trim to create a sense of expansiveness. - The interior is a warm gray to create a modern yet cozy feeling (a dark gray interior is a manufacturer's option on the L Limited, X, and X Limited grades). - The premium sofa-style seats evoke an image of European furniture, while the stitches on the seats emphasize the combination of different materials to enhance the feeling of luxury. Through a design that coordinates the seat coverings with the accent color lines, the overall integrity of the interior is ensured. MOVE Conte CUSTOM Design Exterior CUSTOM Styling Wrapped in Attractiveness - The MOVE Conte CUSTOM design seeks to create a strong impression of sleek urban quality, based on the concept of customization. - An impressive front view is created through the vertical two-lamp configuration low-beam discharge headlights, combination front grille with smoked acrylic and plated moldings, and front aerodynamic bumper. - Side stone guards and a rear aerodynamic bumper, together with a low suspension and 15-inch aluminum wheels on the CUSTOM RS create a low center of gravity and an impressive silhouette. - The rear spoiler and clear crystal rear combination lamps create a sporty impression. - Available in a nine different colors*3 (including a new color) to establish a powerful presence. *3: Including three manufacturer optional colors Interior Black-based Interior for an Attractive, Luxurious Feel - Compared to the bright interior of the MOVE Conte, the MOVE Conte CUSTOM adopts a cool, refined, and soothing black-based interior. - Silver accent color lines, plated components, and the three separate meters with bright white light enhance the feeling of power. - The premium sofa-style seats feature exclusive custom black seat coverings. The accent color is silver, sharpening the overall impression. - The CUSTOM RS features subdued instrument panel illumination to accentuate the interior, as well as a leather covered steering wheel manufactured by MOMO to emphasize the vehicle's exclusive custom-made features. 2) Comfortable Interior Premium Sofa-style Seats Create a Comfortable and Relaxing Interior, while the Driver-side Power Seat Facilitates Entry - The premium sofa-style seats created by a French designer feature meticulous stitching that emphasizes the combination of different materials, and the use of accent colors enhances their stylishness. The shoulder portions of the seats extend laterally to provide added support, and the ample size of the seats recreates the feeling of sitting on a sofa. - The MOVE Conte is the only minivehicle*1 with a driver-side power seat featuring an electric seat sliding mechanism for easy entry (excluding the L and CUSTOM X; available on the CUSTOM X as a manufacturer's option). — A seat slide switch is used to electrically slide the seat back 80mm,*4 thus increasing legroom and facilitating exit from the vehicle. — The seat is fitted with a preset driving position system allowing the seat to be adjusted to a preset position at the touch of a button. — The power seat sliding mechanism allows the seats to slide forward and back (240mm*5) in a seamless movement, enabling the driver to find the optimal position. *4: As of August 2008 (Daihatsu survey) *5: As measured by Daihatsu A Spacious Interior that Creates Additional Comfort for Front-seat Passengers - The windshield contains infrared-absorbent glass to reduce infrared light and keep temperatures from rising. - Thanks to the square-shaped body 765mm*6 of space are secured, from the driver's eye point to the top of the front. This provides an expansive field of view, creates an open feeling, and facilitates driving. - The 1,350mm interior height provides ample headroom, and the bench seat and easy-to-use column shifter ensure ample legroom. *6: As measured by Daihatsu Exceptionally Quiet and Smooth Ride Improves Comfort - A quiet and comfortable ride is achieved based on MOVE technology, which provides quietness at the top of its class. - The dashboard and body structures (such as the cowl) have been improved to greatly reduce vibration transmitted from the tires to the body. Combined with optimal placement of sound insulation on various components, road noise is substantially cut. - The use of a medium-wave resonator (on vehicles with the KF-VE engine and CVT) and a higher grade of sound insulation coupled with optimal placement greatly reduce engine noise. - The shapes of the front pillars and door mirrors have been optimized to reduce wind noise. - Based on the MOVE suspension structure, which achieves performance that surpasses its class, the vehicle has been fine-tuned to achieve stable chassis behavior by optimizing resonating frequencies to create a soft and comfortable ride for everyday driving. 3) Outstanding basic performance handed down from the MOVE Driving Performance Combining the Latest Power Train Technologies Achieves Outstanding Fuel Efficiency and Acceleration - The MOVE Conte features two different engines from the Topaz Neo series. The KF-VE twin-cam DVVT*7 three-cylinder engine has a long-stroke and compact combustion chamber to provide ample torque (even at low and medium speeds) and outstanding fuel efficiency, while the KF-DET twin-cam, three-cylinder turbo engine provides strong, smooth acceleration from starting up to high speeds. *7: DVVT: Dynamic Variable Valve Timing - The compact CVT (Continuously Variable Transmission) that is optimal for mini vehicles adopts the input-speed reduction type three-shaft gear train system (first developed by Daihatsu), contributing to outstanding acceleration and highly efficient drive force transmission. - The combination of the KF-VE engine and CVT achieves 23km/l fuel efficiency along with outstanding acceleration. Safety performance Safety Performance that Meets Next-Generation Safety Standards - The TAF*8 collision-safety body achieves a balance between outstanding collision impact absorbance and a rigid and lightweight cabin by employing front-side members with a high-efficiency impact-absorption structure, a collision impact distributing vehicle structure, and high-rigidity steel plates. *8: TAF: Total Advanced Function refers to a vehicle body with advanced collision impact absorbing functions. - The vehicle has easily met collision safety standards for Japan as well as Europe. World-class safety levels have also been achieved for full head-on frontal and side collision tests at 55km/h, frontal offset collision tests at 64km/h, side-on collision tests at 55km/h, and rear-end collision tests at 55km/h. On top of this, it was demonstrated-on the basis of considering actual accidents and carrying out vehicle-to-vehicle collision tests (50km/h frontal collision, 50km/h side-on collision) based on Daihatsu's own targets-that the MOVE Conte secures an ample survival space for passengers and achieves superior occupant protection. - The interior is based on the concept of SOFI (Safety-Oriented Friendly Interior). — The driver's seat and the passenger seat are equipped with dual-stage SRS (Supplemental Restraint System) airbags as a standard feature. — 3-point ELR (Emergency Locking Retractor) seatbelts equipped with pretensioners and force limiters for the front seats, an impact-absorbing steering wheel that limits impact to the driver's head and body, and a structure that prevents rearward movement of the brake pedal to reduce impact to the driver's legs are also standard features. - The pedestrian injury-lessening body is designed to prevent injuries to the head, the most susceptible area, in the event of an accident with a pedestrian, including impact-reducing structures and force-absorbing spaces in the resin cowl, wiper pivots, and hood hinges. - ABS with EBD (Electronic Brake-force Distribution) and Brake Assist is installed as a standard feature (manufacturer's option only on the L, L Limited models). Environmental performance A Vehicle with Minimal Environmental Impact throughout its Life - The MOVE Conte is a creation of Daihatsu state-of-the-art plants. 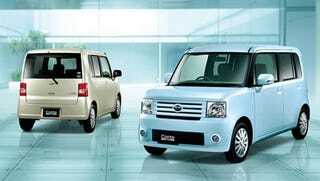 It is the first new model to be produced at the Oita (Nakatsu) Plant No. 2 of Daihatsu Motor Kyushu Co., Ltd, which became operational in December 2007. The Plant No. 2 has the same production capacity as the Oita (Nakatsu) Plant No. 1, which has been positioned as a model environmental plant, but has a significantly smaller floor area and fewer processes, which reduces energy consumption and CO2 emissions. The engine used on the MOVE Conte is produced at the Kurume Plant, which became operational in August 2008. - Daihatsu employed Eco-VAS (Eco-Vehicle Assessment System), a comprehensive approach to assessing environmental impact, to efficiently set targets and reduce overall environmental impact throughout the vehicle's lifecycle (from production and use to disposal), thereby improving overall environmental performance. - The total volume of CO2 and other air-polluting substances released throughout the entire lifecycle of the vehicle-not only at the driving stage, but at all stages from production to disposal-has been reduced using the results of Life Cycle Assessment (LCA). - Through the adoption of the Super Intelligent Catalyst, systems to accelerate catalyst activity, and other means, all vehicles equipped with the KF-VE engine and the KF-DET engine have been certified as having emissions levels that are 75% and 50% lower, respectively, than the 2005 Exhaust Emissions Standards set by the Japanese Ministry of Land, Infrastructure and Transport. - 2WD vehicles of the X, X Limited and CUSTOM X models meet the 2010 Fuel Efficiency Standards + 25% level and 4WD vehicles meet the 2010 Fuel Efficiency Standards + 20% level respectively, as well as the Approval System for Low-Emission Vehicles, thus qualifying for incentives under the Japanese government's green taxation system that is intended to promote widespread use of fuel-efficient, low pollution vehicles. Package A Balanced Package that Seats Four Adults Comfortably and Accommodates Plenty of Cargo - The adoption of a 2,490mm long wheelbase and a reduction in the size of the engine compartment make possible an interior length of 2,000mm. Optimal placement of the front and rear seats, by taking advantage of this ample length, achieves a distance of 955mm*9 between the front and rear seats. The balanced package creates a high and wide interior space that can comfortably accommodate four adults and has a large space for luggage. - The backseat floor hump is minimized to create flat-surfaced legroom in the rear. - The rear seats are positioned to create a comfortable rear-seat cabin space while making the luggage space easy to access. The versatile seat arrangement can respond to a variety of situations. *9: As measured by Daihatsu Utility Comfort and Convenience Plus Functionality and Amenity - Numerous functional storage areas include a large-capacity tray under the passenger seat with a depth of 10cm*10 and a storage box above the glove compartment. - A "key-free" electric keycard system with an immobilizer function allows drivers to easily lock and unlock the doors and there is also an "engine switch knob" to turn the engine on and off (excluding the L and L Limited grades). - Side mirrors that enhance visibility to the rear left of the vehicle, an area of poor visibility when reversing (for parking, etc. ), and rear window wipers that operate when the vehicle is in reverse, as a safety-enhancing feature when backing up in the rain, are standard on the X Limited and CUSTOM RS grades (manufacturer's options on the X and CUSTOM X grades). - An Adjustable Pack (including driver's seat lift, tilt steering wheel, and adjustable shoulder belt anchors), which enables drivers to set the optimal driving position depending on their physique and driving stance, is a standard feature on all models (manufacturer's option on the L and CUSTOM X grades). - Plasmacluster Ions®*11 an air-cleaning technology that uses a dedicated clean-air filter to remove pollen and create a comfortable interior is available as a manufacturer's option on the X, X Limited, CUSTOM X, and CUSTOM RS grades.